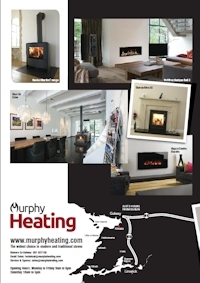 Murphy Heating | Supplying stoves all over Ireland since 1969! Our extensive portfolio of stoves, fires and range cookers includes products from Europe's leading manufacturers, whose units incorporate the latest cutting edge technology resulting in energy efficient and environmentally friendly products. With many choices from traditional to contemporary, the product range caters for all type of situations and requirements. As every house is unique, and every customer needs are different, at Murphy Heating we have something to suit everyone.